(Nanowerk News) Marginal lands--those unsuited for food crops--can serve as prime real estate for meeting the nation's alternative energy production goals. In the current issue of the journal Nature ("Sustainable bioenergy production from marginal lands in the US Midwest"), scientists at Michigan State University (MSU) and other institutions show that marginal lands are a huge untapped resource for growing mixed-species cellulosic biomass. These lands could annually produce up to 5.5 billion gallons of ethanol in the Midwest alone. 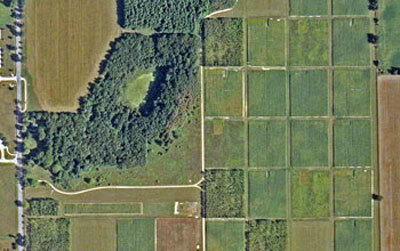 Satellite view of the cropping systems experiment: Each rectangle is 2.5 acres. Cellulosic ethanol is a biofuel produced from wood, grasses or the inedible parts of plants. "Understanding the environmental impact of widespread biofuel production is a major unanswered question in the U.S. and worldwide," said Ilya Gelfand, lead author of the paper. "We estimate that using marginal lands for growing cellulosic biomass crops could provide up to 215 gallons of ethanol per acre with substantial greenhouse gas mitigation." The notion of making better use of marginal lands has been around for nearly 15 years. However, this is the first study to provide an estimate for greenhouse gas benefits, and an assessment of the total potential of these lands to produce significant amounts of biomass, Gelfand said. Focusing on 10 midwestern states, researchers from MSU, the Pacific Northwest National Laboratory and the University of Maryland used 20 years of data from the National Science Foundation (NSF) Kellogg Biological Station (KBS) Long-Term Ecological Research (LTER) site. Kellogg Biological Station is one of 26 such NSF LTER sites in ecosystems around the world from grasslands to deserts, coral reefs to tundra. "The study underscores the critical role that long-term basic research plays in determining the optimum balance between economic prosperity and environmental sustainability," said Saran Twombly, program director in NSF's Division of Environmental Biology. "Long-term basic experiments suggest that wise management of marginal lands, rather than wholesale conversion of valuable agricultural lands, could contribute significantly to a sustainable future," Twombly said. The scientists characterized the comparative productivity and greenhouse gas impacts of different crops, including corn, poplar, alfalfa and old-field vegetation. They then used a supercomputer to identify and model biomass production that could grow enough feedstock to support a local biorefinery with a capacity of at least 24 million gallons per year. The final tally of 5.5 billion gallons of ethanol represents about 25 percent of Congress' 2022 cellulosic biofuels target, said Phil Robertson, co-author of the paper and director of the KBS LTER site. "The value of marginal lands for energy production has been long-speculated and often discounted," he said. "This research shows that these lands could make a major contribution to transportation energy needs, while providing substantial climate and--if managed properly--conservation benefits." This is also the first study to demonstrate that grasses and other non-woody plants that grow naturally on unmanaged lands are sufficiently productive to make ethanol production worthwhile, he said. Conservative numbers were used in the study, the scientists said, and production efficiency could be increased by carefully selecting the mix of plant species. – No carbon debt from land conversion, if existing vegetation is used or if new perennial crops are planted directly in existing vegetation.